I was firstly a bit messy by swooshing a tag into some cosmic shimmer sprays, then used water and distress inks to add colour into the white areas of the tag making it look like sky and earth. I then took a ‘Sheena ‘ branch stamp and made a tree, and took my hobby art stamps and made trees, hills and grass with Stazon Black ink. I then took my Stampavie ‘caravanette’ stamp and stamped this out onto different coloured card and paper pieced it. I thought Moth Fab would love having ‘adventures’ in this! I then took ‘Moth Fab’ stamped her out in versamark and heat set with WOW ebony embossing powder and coloured her in with Promarkers. The suitcase is a very old stamp which I had. The ‘leather look’ was made by applying stick glue to a dotty stamp then stamping onto a piece of white cardstock, then using walnut stain distress ink and sponging this on the card over the glue before stamping in versamark and heat setting with Ebony Embossing Powder. The glue picks up the ink and makes it darker and a ‘suede’ look in places – try it. The sentiment is brill, I got it off the Internet and printed it onto patterned cardstock and cut out. it makes me want to go with her…..
Wow! What a fabulous project! Great details and quote! Thanks for joining us for the Simon Says Stamp Challenge! I am in love… That background is out of this world and all the details. The quote brings it all together. 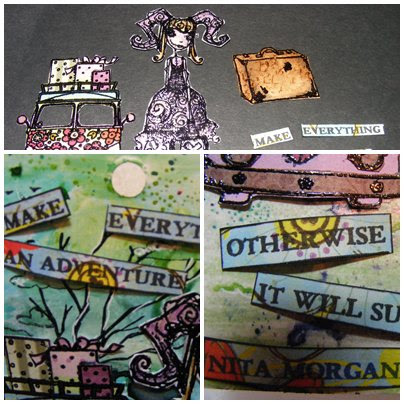 Thank you for sharing your talents with us at Stampotique Designer's Challenge. Fabulous card! I love all the details on it. Thanks for making it for Stampotique this week. This is so fun and full of adventure! The 'swooshed' background looks fantastic and I LOVE the hippie Micro Bus!! Thanks so much for sharing your wonderful tag with us at Anything But a Card!